Large swathes of the usually humid southern China are currently facing drought, described as the worst in 50 years. The drought has left over a million people short of drinking water and has shrunk rivers and water reservoirs, the state media reported. Between November 5 and December 10, Guangxi Zhuang--the country's main sugarcane growing region--received just 0.5 mm of rainfall, which is the lowest amount of rainfall for this period since 1951. The other drought-stricken provinces in the southern region are Guangdong, Guzhou, Hunan, Hubei and Jiangxi. The water level on the Beijiang river in northern Guangdong fell to 3.79 metres in early December, delaying vessels until dredging was carried out. Water level in Poyang Lake--China's largest freshwater lake--in Jiangxi province is at a record low. "The lake now covers less than 50 sq km, down from about 3,000 sq km in summer this year. The water surface was 300 to 500 sq km last winter," the Hydrological Bureau in Jiangxi said. 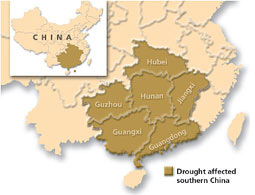 Droughts occur frequently in China, with the north of the country particularly parched. But in recent years, areas in the traditionally wet south and eastern areas have also had unusually dry weather, with drought afflicting more areas with greater frequency, says the State Flood Control and Drought Relief Headquarters. "Scant rainfall and warm weather have combined to cause severe drought in southern regions," says Chen Lai, the minister of water resources, who has blamed the drought largely on global warming. In an urgent circular, the State Council has asked departments concerned to build sufficient water resources and undertake water-saving efforts to tackle the drought and maintain agricultural water supply for the winter and spring. The government has announced 70 million yuan ( us $9.46 million) to support relief programmes.